Bass fishing is getting much better with warming weather. Daniel and Matthew Bishop went fishing with grandpa Dan Bishop form Page AZ. 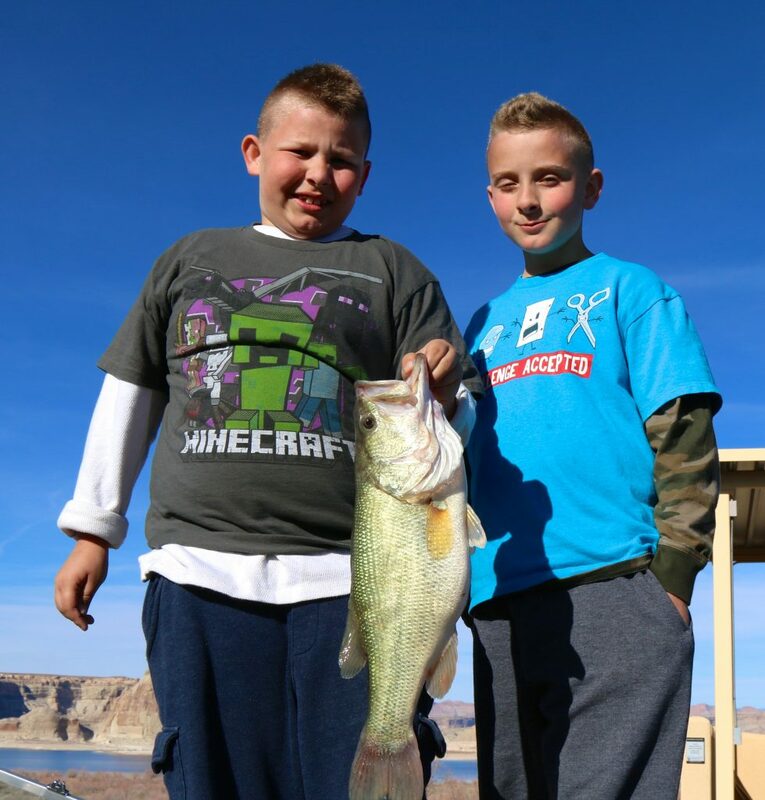 Daniel caught this 3- pound largemouth in Navajo Canyon and has bragging rights over his brother and grandpa. 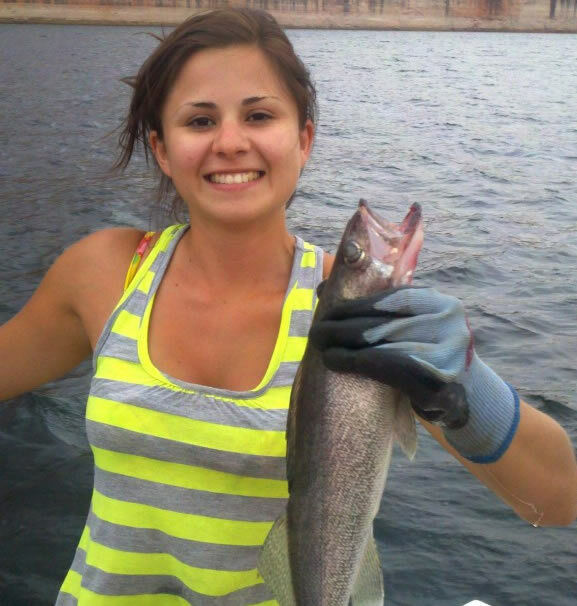 Springtime for Lake Powell fish effectively arrives today. Air temperature at Lake Powell will climb into the 60s today and soar to the 70s later in the week. Water temperature will rise from the high 40s to the mid 50s by the weekend. Warm water fish will take immediate notice of the warming water. Smallmouth bass don’t really get in gear until the early morning water temperature is 57 degrees or above. Largemouth bass are the first to respond. With warming this week, largemouth will get more active, look for an easy meal of crayfish, sunfish or shad, and be much more interested in bass jigs. Expect the afternoon water temperature to climb to the 60’s by the weekend. I am an early morning fishermen and often reap the rewards of getting out early, but that does not really matter when pursuing largemouth bass this week. Afternoon fishing in warming water will be better than morning fishing in cool water. Largemouth enjoy cover. At the current low lake levels, flooded brush is hard to find. If you see a submerged tumbleweed pile, a bush with thick branches, or some other cover that may hold a bass, cast to the cover. It is wise to use a weedless lure and a slow presentation when fishing for largemouth. When cover is completely lacking find the warmest water and cast there. If there is no brush then find large rocky structure with a bit of shade where bass wait to ambush a shad or sunfish. This is the time to catch big, heavy bass before the spawn when large females are full of eggs. Expect to find more bass in the backs of canyons where water is green or murky. Clear water is not as “bassy”. Due to low water and lack of brush, largemouth bass are not as numerous as smallmouth bass. I recommend that all largemouth bass that are caught be released so they can successfully spawn and increase bass numbers lake wide. Surprisingly, if you want to harvest a bass then the females are the ones to keep. Males guard the nest and tend the kids. Next month, when sight-fishing for bass, males are the bass seen guarding the nests. These little guys are the ones that must be released. If you want to keep a bass then make sure it is a smallmouth bass. They are available in large numbers and great for a fish dinner. You can keep up to 20 smallmouth bass each day. Walleye are more excited about warming water than largemouth bass because warming triggers walleye spawning. Reports are starting to come in from the northern lake that walleye have been captured on spoons in 60-80 feet of water. These prespawn walleye aggregations will turn their focus from feeding to spawning which occurs at night on submerged rockslides. That means walleye will be harder to catch now but they will be post-spawn hungry and ready to provide an epic fishing experience in April and May in the northern lake. Put that on your calendar. Striped bass are still quite catchable. The question now is when will stripers show up at the dam or other locations in the main channel and provide great fishing for all that use bait. No reports of bait fishing success have been received yet. Fishing success is still solid for those using the troll/cast/spoon techniques that have worked all winter long. Stripers are still finding shad in the backs of canyons and can be caught by trolling shad imitating crankbaits that run from 8-25 feet in the murky water in the backs of canyons. My fishing success has dropped off during the last few trips. The weekly trip tally has dropped from 75, to 55, to only 30 stripers caught yesterday. I know, no one is going to feel sorry for me bringing in 30 stripers, but it just means that conditions are changing and I have to look in other locations as stripers are on the move. Good striper reports are coming in from murky water in the backs of Navajo Canyon, Lone Rock Canyon, Warm Creek, Padre Canyon, Last Chance, and Rock Creek. Trolling and casting works best. Spoons are still working periodically with the silver Kastmaster lures working better than the standard jigging spoons. It is exciting to see spring fishing take off again. It makes we want to go fishing at Lake Powell!